Microsoft gave Windows 10 a spin at the Consumer Preview Wednesday, January 21, showing off a slew of new features, universal apps and an updated personal assistant. No word as of yet on what exactly “free” will entail, but we do know this—for the 10 percent or so of users running Windows XP, you will need to upgrade first to Windows 7 or higher. A solid release date for Windows 10 was not announced. Stay tuned for this, we are closely watching these developments. Rumors indicate a summertime launch. The new Cortana now sits at your desk with you. The Microsoft personal assistanthas her own “home page” on PCs running Windows 10, and appears when you beckon her. Her features are personalized enough to search through your files. 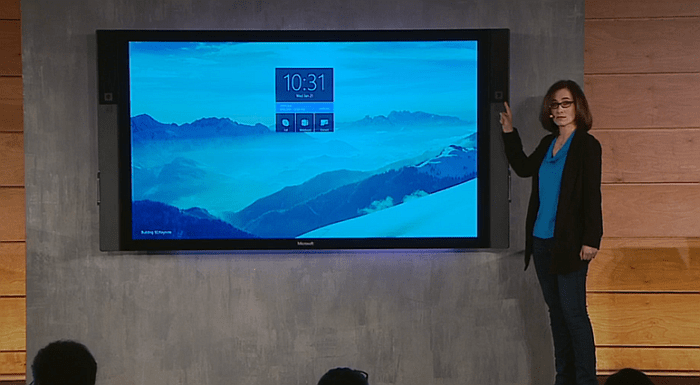 In the demo, Windows presenter Joe Belfiore called up voice-activated PowerPoint slides on stage, and sent the files through Outlook without the click of the mouse. More importantly, Cortana’s features tie-in to Windows tablets and Windows phones where finding and sending aren’t as easy. 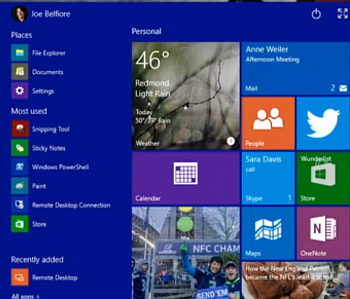 Universal app experience is the main thrust of Windows 10 UI. 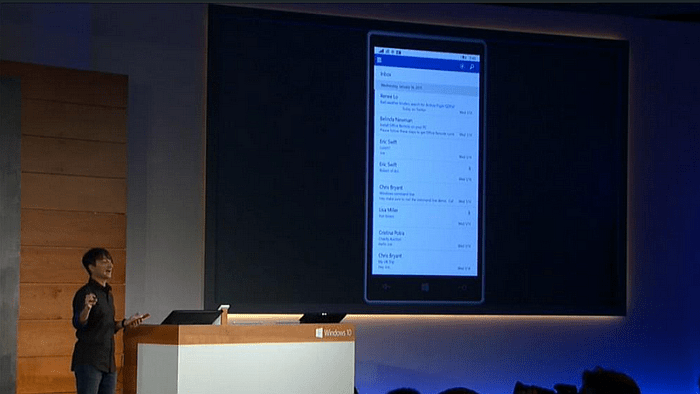 To show off these features, Belfiore moved the presentation over to his Lumia 1520 phablet to demo full versions of Word, Excel and PowerPoint on a Windows 10 phone. For people who like good formatting in their e-mails, this is a big feature. The universal Outlook and Calendar app were not ready in full for the briefing, but a synced desktop-to-phone Outlook Calendar has been promised. 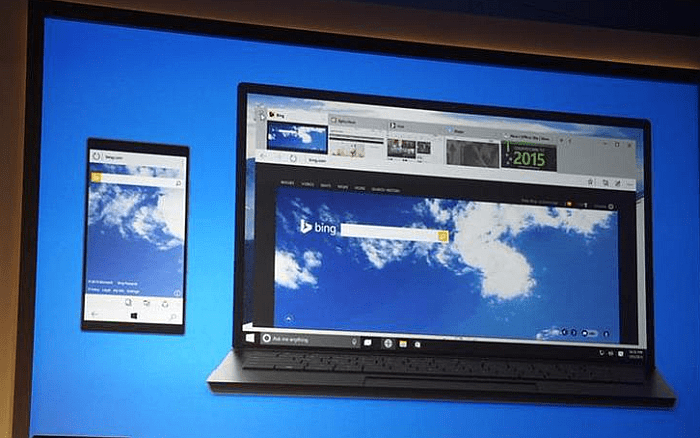 We got a glimpse of Spartan, the much anticipated replacement of the beleaguered Internet Explorer. There’s a streamlined UI, which looked clean enough and focused on page content. Business users will appreciate the built-in support for PDF files, which can be saved and marked up—with the help of a stylus. Microsoft is going big in the boardroom. On the large format display front, Microsoft showed us something impressive. The Microsoft Surface Hub is an 84-inch 4K display that offers multi-touch, multi-pen support, and can communicate with several devices in the room. Microsoft took a turn towards Star Trek with the announcement of holographic goggles. The brainchild of presenter Alex Kipman, with his Muppet-like way of speaking, Project HoloLens positions itself beyond the obvious confines of gaming. Microsoft has aspirations for how HoloLens and its apps will change how users consume apps like Skype, CAD and prototyping software. It was all still very conceptual—for more on this, Wired got the exclusive. Microsoft presenters said more than once Windows 10 is going to change the way people use PCs—a message that did not quite resonate with users who complained that Windows 8 was too different from what they were used to. Free is always nice and there are other signs of optimism, namely a Start button in Windows 10, which is a good way for winning over stubborn Windows 7 users. Upgrade to Windows 10 is free but will its updates be as well free? I heard some rumors that there are plans to charge users for updates and security patches. Any idea if that’s true?